How Do I Make It Look Like A New Seat? Tools needed for a re-upholstering job. To start, place the seat bottom on the workbench. (If the bench is used for other projects it is best to cover it with an old sheet or blanket to prevent soiling the seat cover.) Take the seat bottom cover and turn it inside out. XKE seats before rebuilding, along with their new covers. Looking at the underside of the cover, there are probably muslin fabric channels hanging down that require the insertion of a piece of wire. 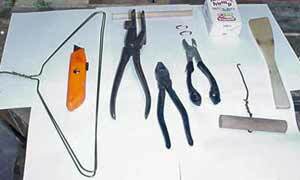 This wire will be the attaching medium that will hold down the "bolster" part of the cover to the seat frame. 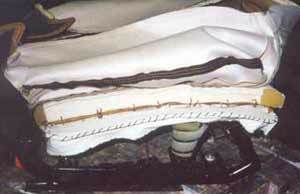 If you saved the original wires and they are in good condition, insert them in the fabric channel. If not, cut a piece of coat hangar wire to fit. This is what electric carving knives are really made for...shaping foam rubber. 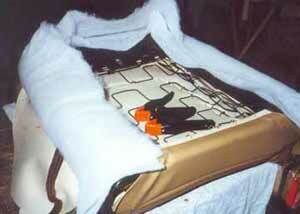 Our Ford seat cover is bolstered on both sides and the rear, requiring three pieces of wire. Yes, we cut off the end of the coat hanger later. This principle can't be stressed enough. Therefore, we put the first hog clip at the center of one wire channel and attach it to the seat frame from underneath. Flipping the seat back up, we center the cover front-to-back and attach a hog clip to the center of the opposite wire channel, attaching it to the seat frame. Working side to side, we progressively work our way from the center out on both wire channels. When finished, the center portion of the seat should look nice and smooth and the cover itself in proper alignment. The center portion of the cover is hog-clipped to the seat frame. Note that bolter's foam components are removed for clarity. A little demonstration of proper hog-clipping. Now it's time to stuff the bolsters. We first installed the foam bolsters, keeping them in place with a little spray glue* to keep them from shifting as we pull the seat cover over them. Before that, however, we need to plan how much stuffing (batting) to use, so it's time for patience and attention to detail. Nothing looks worse than a poorly-upholstered seat that is lumpy or shows weird stretches and wrinkles. No seat cover fits perfectly, and that's what the batting is for. *Speaking of spray glue, the best stuff we've tried is Camie 303, a foam and fabric spray adhesive. It is manufactured for upholstery professionals, but you can contact them at 800-325-9572 to find out where you can get some. It works great, holds fast and comes in 24-oz cans. A single can will typically do several seats. The seat cover on the Ford, pulled over only the foam core. Note looseness and lack of an upholstered appearance. Since we are bolstered on both sides and the front, we first pull the seat cover over the entire foam core just to see how it fits and to get a feel for how much stuffing we'll need. 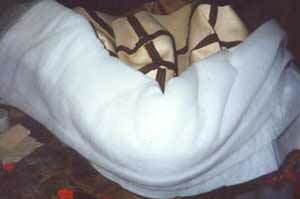 Pull the cover (from the center, using the stretching pliers) snugly over the front bolster. If it doesn't look nice and "puffy," take a guess how much batting should be laid underneath to make it right. Lift it back up, lay in some batting and pull it back down. Take a look at the mountain of batting in the Ford seat. It never hurts to stuff things a lot. The batting will try to bunch-up, so you need to be able to keep it smooth and even. 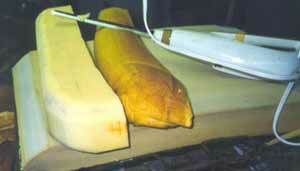 To do so, use the wooden spatula. For those little "puckers" in the seat cover that require a bit more stuffing, use the rounded wooden dowel to push material around. Do this until the overall appearance is what you want, but remember that the seat should end up looking "inflated" so that it will feel comfortable in use and the fabric will look well done. The batting is beginning to take shape on the Ford. Repeat the bolstering work on the side bolsters, pulling the seat cover over everything often until you get the desired appearance. You will appreciate the stretching pliers while doing this, because seat covers are usually very stiff and hard to "work." When it looks like everything is going to work out, it's time for the hog clips. We usually start at the front of the seat, in the center of course. This Lamborghini seat needs a bit of stuffing. Tip: Before using the hog clip pliers, wrap duct tape around the handles several times, to build up a "padded" handle grip. Your hands will appreciate the comfort after you've compressed a few dozen hog clips. 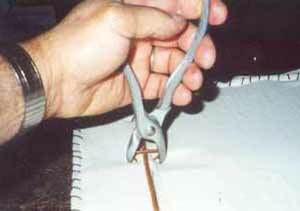 We always "load" the hog clip pliers with a clip so that it's ready to fasten. Then, using the stretching pliers, we pull the seat cover down nice and tight and clip the cover to the appropriate point on the seat frame. Moving outward from center, we pull and clip, pull and clip until we get close to the corners. The ford seat looks pretty good, but needs more batting to remove puckers. Look at the seat. If it needs a little more batting (as in the photo above) cut the hog clips off with the heavy-duty pliers and peel the cover back to add material. When pulling, stretching the cover fabric, whether leather or vinyl or cloth, always make sure you don't tug the seams so hard that the stitching fails. Cloth seat covers, usually Mohair or nylon, are the easiest to stretch and to upholster from a purely mechanical viewpoint. However, any folds or ripples in the batting material show through cloth more readily, so upholsterers "way back when" used to cover the seat in muslin fabric first, then pulled the seat cover over it. Leather is very stretchable and is quite forgiving when covering seats, but it is relatively easy to tear. 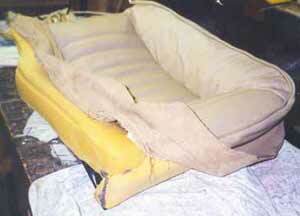 Always apply a coat of leather conditioner that contains lanolin to both sides of the seat cover before upholstering. It makes things easier and enhances the life of the leather. 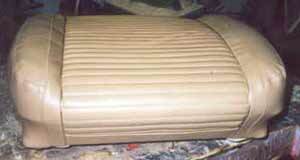 Vinyl is the most rugged of seat cover materials and the most common used during the 1960s. 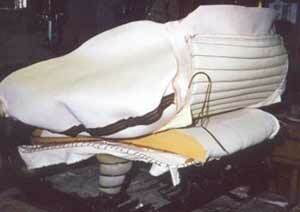 It is very stiff and therefore more difficult to stretch over seat bodies. Also, its stiffness requires more batting and a bit more patience to get the job done right.